During my tenure at VUW I was in a role responsible for promoting the engineering school to potential students who were in their senior years of secondary school. As an engineer I'm not much of a conventional marketing person, powerpoint slides and laser cut trinkets don't cut it for me. I also started playing with such toys as water rockets at a very early age... Enter the idea of running a challenge where engineering and school students are pitched against each other. Several emails later and my manager was convinced to go with the idea. Now in it's simplest form a water rocket is nothing more than a bicycle tyre pump, a rubber stopper with a valve stem through it and a softdrink bottle. 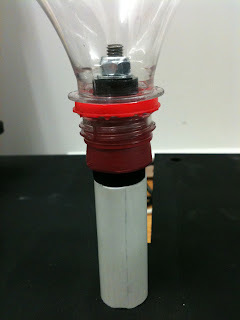 You fill the bottle say half with water insert the rubber stopper and pump in air. Partially due to being prone to building silly contraptions that run on air and also due to restrictions imposed by the health and safety department. The idea of a joint pNuke and VUW branded water rocket launch system was conceived. 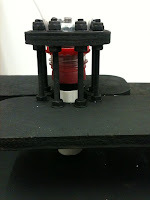 It had to be pneumatic as we already have a supply of air (the tyre pump) and so there would be no electrics to get wet. It had to be black... In all seriousness, I build theatre and movie props... Anything not intended to be seen by the audience is matte black. In the pneumatics stash I have a couple of HiRotor pneumatic actuators... Ridiculously oversized for this job but hey there's no chance of them breaking. The actuators are sandwiched between two laser cut plywood plates to give the base sufficient rigidity. Attached to the actuator shafts are plywood arms which support the two bottle retaining collars. All the plywood components are soaked in watered down polyurethane, allowed to dry before a coat of flat black and a final coat of flat polyurethane. The two collars lock onto the neck of the PET softdrink bottle above the flange on the neck, this ensures that the bottle is held in place very securely indeed. The actuators are connected to the tyre pump after the bottle is pumped up. One firm pump is all that's required to pop them open. As the arms hold the neck of the bottle a good 100mm from the top plate, the bung had to be mounted on some form of standoff. Adding to the complexity is that the bottle is filled with air through the bung. 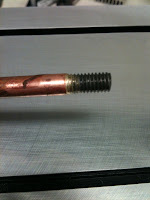 I set about creating what was in effect a hollow "bolt" with a 1/8th BSP fitting on one end to accept the air inlet. This was made up from a modified tail fitting which I drilled to the inner diameter of the copper tubing. 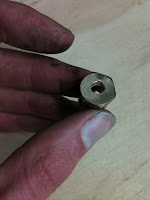 The hole was then counterbored to suit the outer diameter of the copper tube for a snug fit. 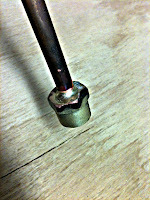 Drilled to suit the pipe i.d. 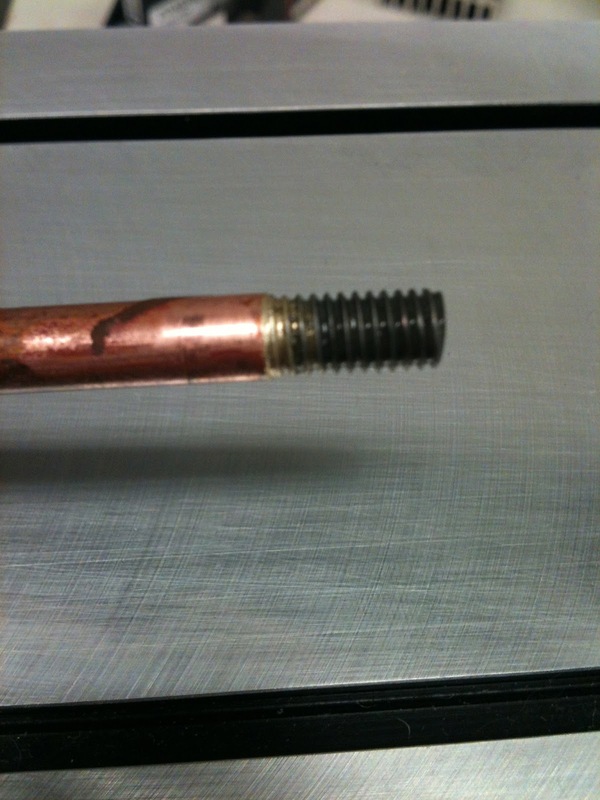 The other end of the copper tube has a short length of hollow M6 bolt silver soldered onto the end of it. 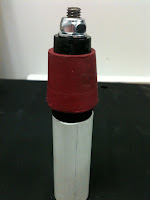 The threads allow the bung, spacers and PVC pipe to all be clamped into place by one M6 Nyloc nut and washer. In testing I realised that the arms don't always open together which can sometimes result in interesting launches... One arm releases the before the other, resulting in the bottle flying off at an odd angle. A temporary fix involving a pneumatic flow restrictor connected to the faster actuator was tried with some success. This will be properly remedied in a future version by use of a timing belt or gears between the two shafts. A number of students, staff, teachers and friends all descended on Izard park in Wadestown to try out the platform and shoot rocket videos. Kent from Onslow college was kind enough to bring their Casio 1200FPS camera along. Slow motion rocket take off video FTW!! Last but not least: Some proof that perhaps pigs can fly... Megan's "Pigtoria" on her maiden flight. Trajectory is a little off due to the bottle falling foul of a hair dryer during construction. Build photos for The rocket Launcher. Why not just have a string to pull to release the bottle, rather than a complicated hydraulic system? In all seriousness, using a pneumatic release allowed us to use a lot more clamping pressure than we could have with a pull string.